You have surely been in the situation where you want to keep a tab open, but also go back in history to open another link on the page you just came from - and have a new tab or new window that not only shows you the same page (same URL or web address), but also "ports" its back and/or forward history with it. Well, this is now possible with a new feature in Internet Explorer called "tab cloning", which allows you to exactly duplicate a tab, and we'll show you how to access and use that feature in this tutorial. If you came to this tutorial in Internet Explorer, and coming from another online location, like a search engine (Google / Yahoo! / Bing....) you will have a back button enabled, which would bring you back to the previously visited pages with a click. If so, let's just use this as an example to illustrate how to duplicate tabs work in Internet Explorer. Also notice from the screenshot above that you can alternatively also use the corresponding keyboard shortcut of Ctrl+K, when the tab you want to duplicate is in the foreground (i.e., is the currently selected tab at whose content you are looking). The screenshot below shows you the original tab, which we used as duplicate example, and the cloned tab on the right, now in the foreground: (the active tab on the picture below). As soon as you do, Internet Explorer will open an exact copy of that same tab, down to the scrolling position; that cloned tab should open in the foreground, and be added in the rightmost position in the tabs row. You can now go back in history without worries, you have a "backup" tab in case you need to go back to it! 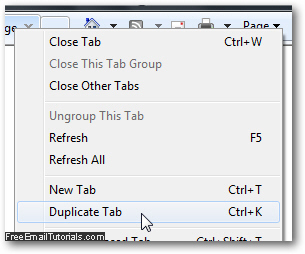 Cloned / duplicate tabs are the type of feature most of us are unlikely to use often, but we will all benefit from knowing that the feature is there, and how to use it when the time comes.